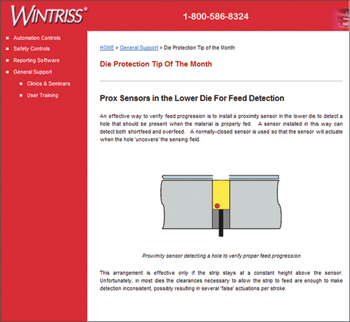 Wintriss Controls Group, Acton, MA, has added a Die Protection Knowledge Base to its website, loaded with tips on sensor selection and installation. Articles already posted to the site include Know Your Critical Angle, Partial Feed Detection, Prox Sensors in the Lower Die for Feed Protection, and Selecting the Right Stop Type. Visit the site regularly, as Wintriss will post a new article each month.